Probate means “proving a will” through a probate court proceeding. There are several ways to transfer property at death, some of which do not require formal court proceedings. For example, a surviving spouse or domestic partner may receive property without any probate proceeding at all. Joint tenancy also can transfer ownership without probate proceedings, as is property left in a living trust and property in a pay-on-death bank account. In the State of California, if the property is not owned in a form that does not require probate, such as certain trusts, and the asset value exceeds $150,000.00, a formal probate proceeding is required. The probate process begins when the personal representative files with the clerk of the probate court a copy of the death certificate along with the will and a petition to admit the will. If the deceased died without a will, then an interested party may file the paper with the court to appoint an administrator to the estate. An administrator generally does everything an executor does, however, the administrator is required to represent the estate according to the state laws instead of the provisions in the will. In a formal probate proceeding, a hearing is required to establish the death of the testator, the genuineness of the will, its conformance with statutory requirements for its execution, and the competency of the testator at the time the will was made. If no one objects to the will at the hearing, it will be admitted to probate. Informal probate proceedings generally do not require a hearing. The personal representative files the death certificate and will, along with a petition to admit the will under informal probate. The clerk of probate court reviews the submissions and recommends to the court that the will be probated. 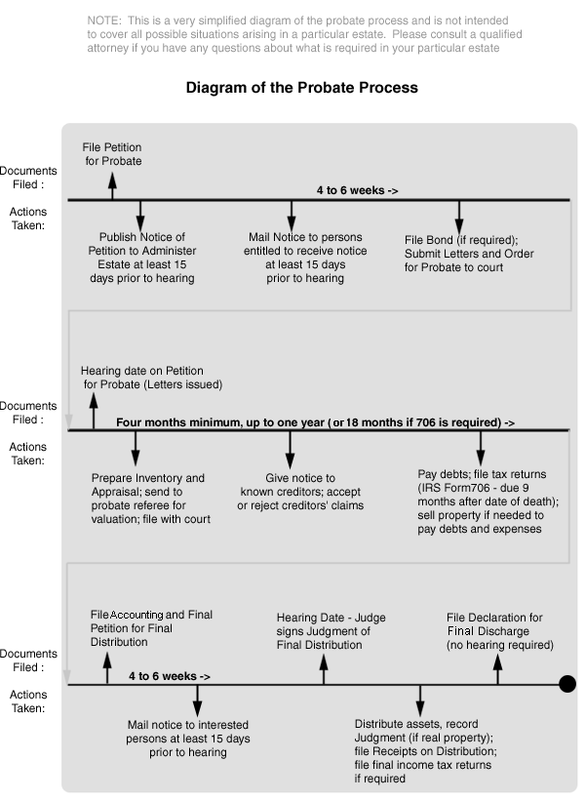 Once the court issues the order for informal probate, the personal representative files a series of forms that demonstrate notice has been given to all interested parties about the probate, the decedent’s creditors have been paid, and the estate’s assets have been collected, appraised, and distributed to the designated heirs.